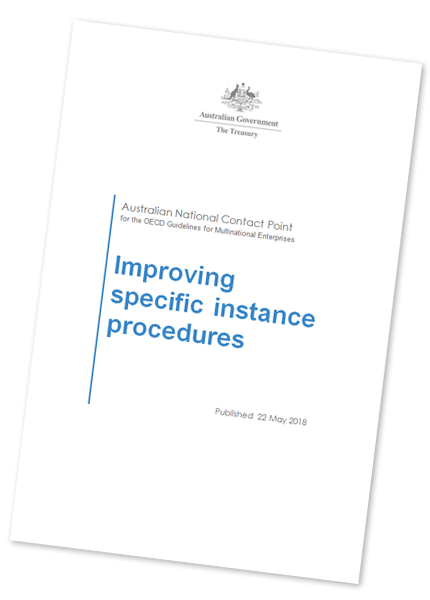 The Australian Government Department of Treasury has released updated specific instance procedures to modernise and clarify how the Australian OECD National Contact Point will handle cases. The accompanying statement from the AusNCP is available here: PDF 393KB | DOCX 162KB. ...Following the Australian NCP's release of its new rules, OECD Watch and several partners have written a letter calling on the NCP to adopt further amendments to ensure these and other critical issues are addressed. The letter is available in full here. The following documents should be used for specific instances brought to the AusNCP. If you are preparing a complaint, or are a party involved in a complaint, we encourage you to read these procedures and make use of our submission form. AusNCP procedures [PDF1.03MB | DOCX479KB] – this explains the processes used by the AusNCP when considering cases. They are based on procedural guidance offered in the OECD Guidelines. Process flowchart [PDF477KB] – this diagram provides a simplified version of the case handling process. *The document in PDF format is attached.